Summer is officially OVER (sniff! sniff!)! The countdown calendar has switched from the number of days until school starts to the number of school days left, which is WAY too many! I’m feeling sentimental because we’ve had a FABULOUS summer! Though I’m not ready for this summer, in particular, to end, I am so thankful for the many blessings we’ve enjoyed. My bucket truly runneth over and I thank the Lord for the many, many ways He has provided for us, giving us time, energy, good health, and finances to do so much! 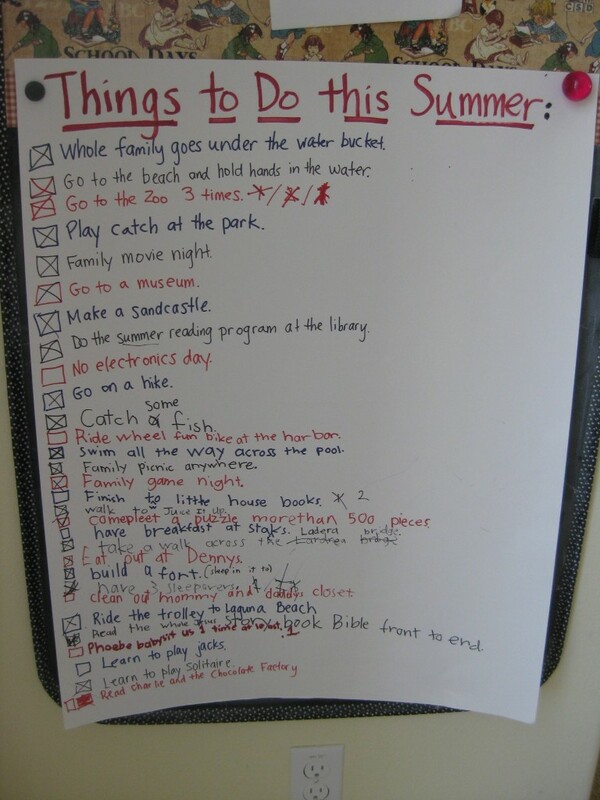 It may sound funny, but I truly think a large contributor to the success of our summer was our Summer Bucket List. 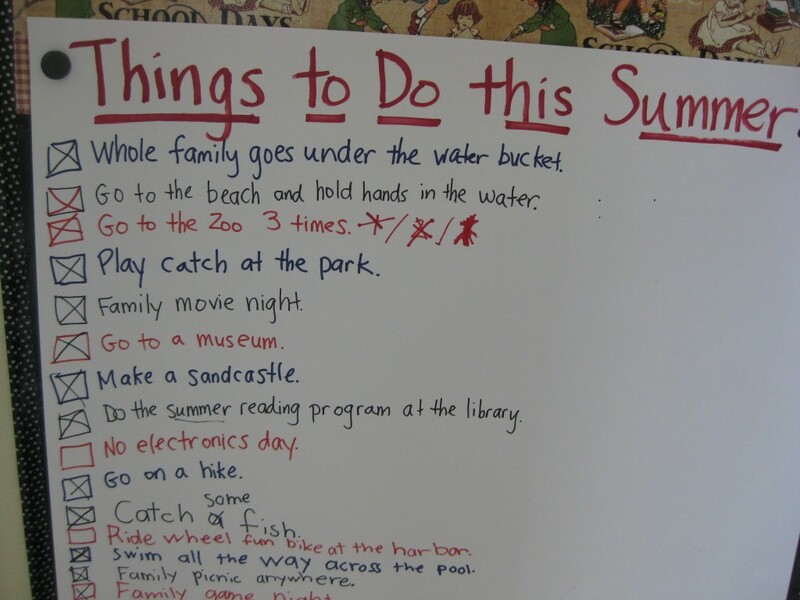 If you missed my post about our summer to-do list back in June, you can catch it HERE. 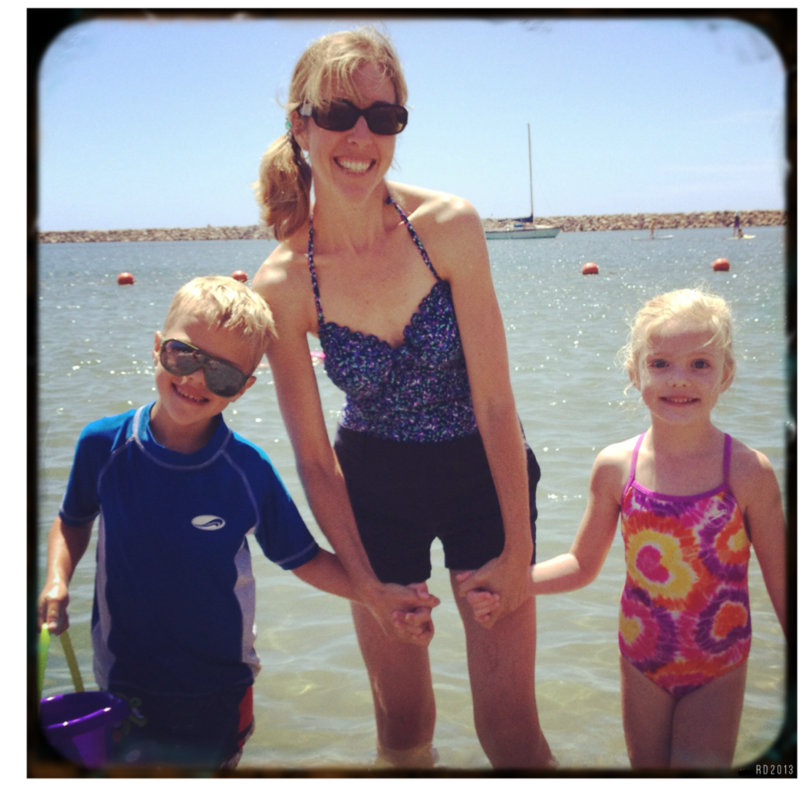 This was the first time we’ve ever attempted a Summer Bucket List, and I’m so glad we did! 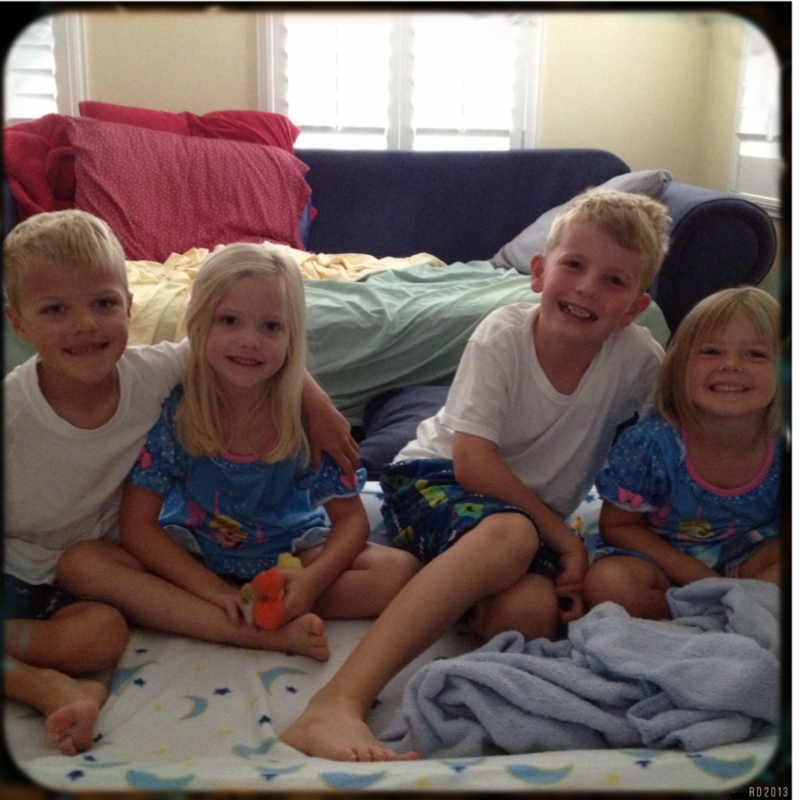 My baby is now 5 ½, so this was the first summer in 8 years of being a parent that we weren’t tied to a nap schedule! Don’t get me wrong, I LOVED the nap years and I’m kind of in denial that they are gone…But, on the upside, there was so much more freedom to explore this summer – so we took full advantage of it! 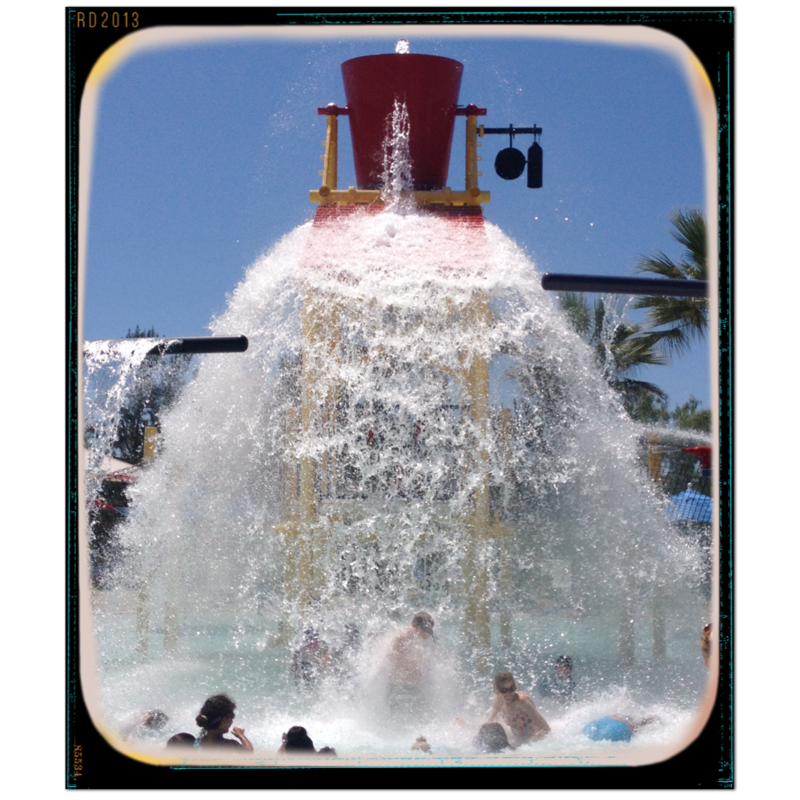 So here it is…our Summer Bucket list, in review! We ended up with 30 different items on our to-do list. The list was dreamed up almost entirely by my kiddos and we didn’t really give them any parameters from the start. In retrospect, we probably should have but we lucked out and they actually didn’t come up with anything unattainable or terribly costly. In fact, the far majority of the activities were FREE! We’ve taught them well how to be cheap, I mean, “money-wise”! Now, as of today, September 5th, we have checked off 22 of the 30 activities!! Woo Hoo! I think that is pretty good for our first attempt! Especially since, technically, summer isn’t over until September 21, so technically, that still leaves us 16 days to polish off the remaining few items. And we are determined to do so! 2. Take a train ride. We had a wonderful family reunion this summer in Colorado with all the extended family on my mom’s side – 40 or so people representing 3 generations from California to Florida and several states in between! Oh what a beautiful state Colorado is! 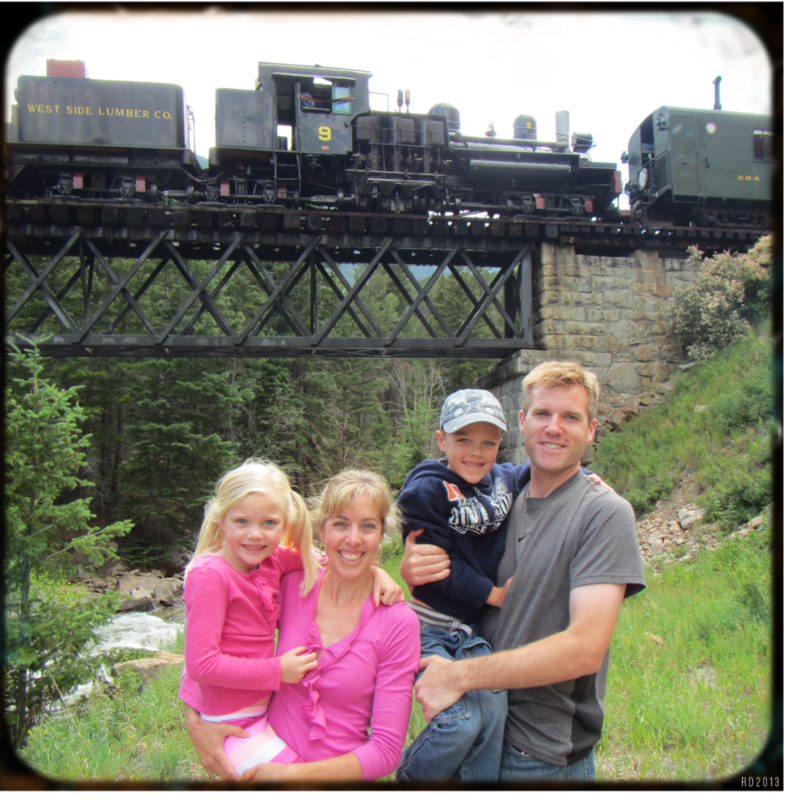 We took 10 days to explore and riding this Georgetown Loop Railroad and exploring the Georgetown silver mine were among our favorite Colorado adventures! 3. Swim all the way across the pool, side-to-side. This one was for Lucy. 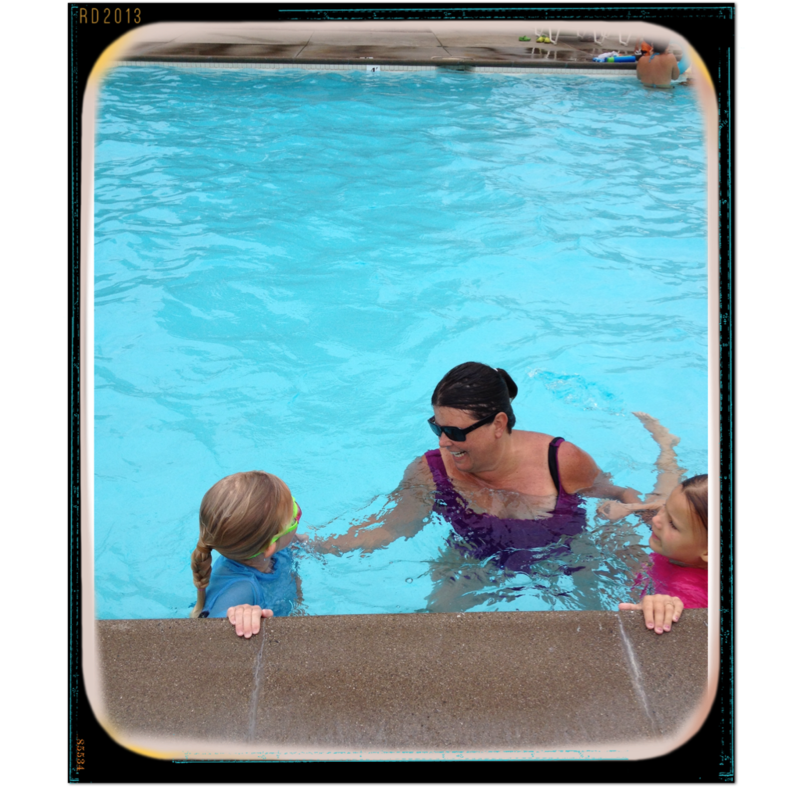 Here she is being congratulated by her swim teacher, Miss Jill, for making it all the way across by herself! 4. Visit to The Focus on the Family Institute in Colorado Springs, Colorado. Wow! What a fun place! 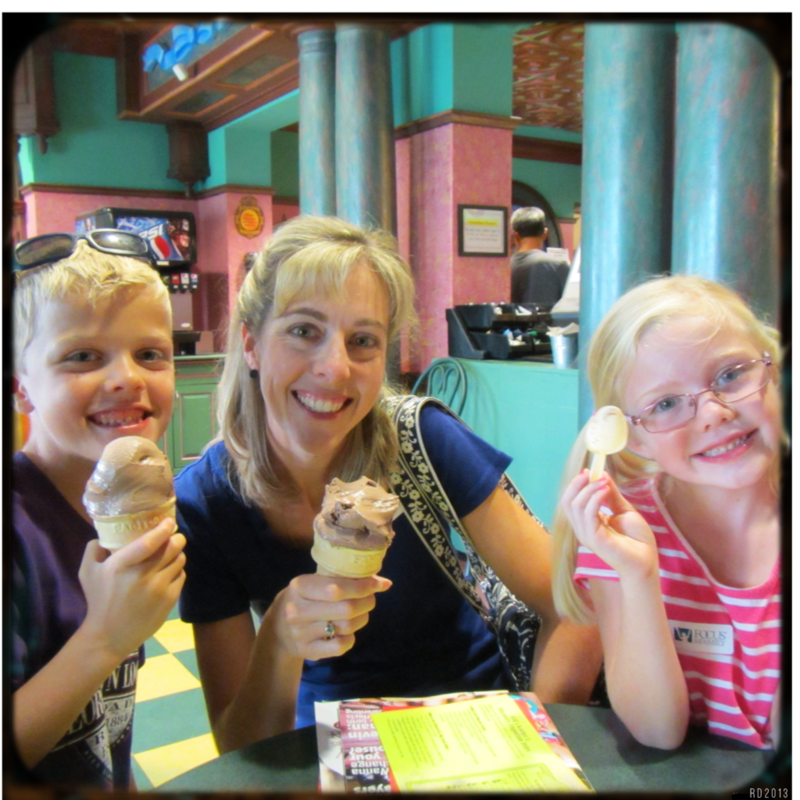 We are big fans of FOTF’s “Adventures in Odyssey” kid’s radio drama and loved getting to enjoy super yummy ice cream at Whit’s End Soda Fountain, explored many of the fun places portrayed on the radio show, and we even got to record our own episode of “Adventures in Odyssey”! That was definitely a highlight! 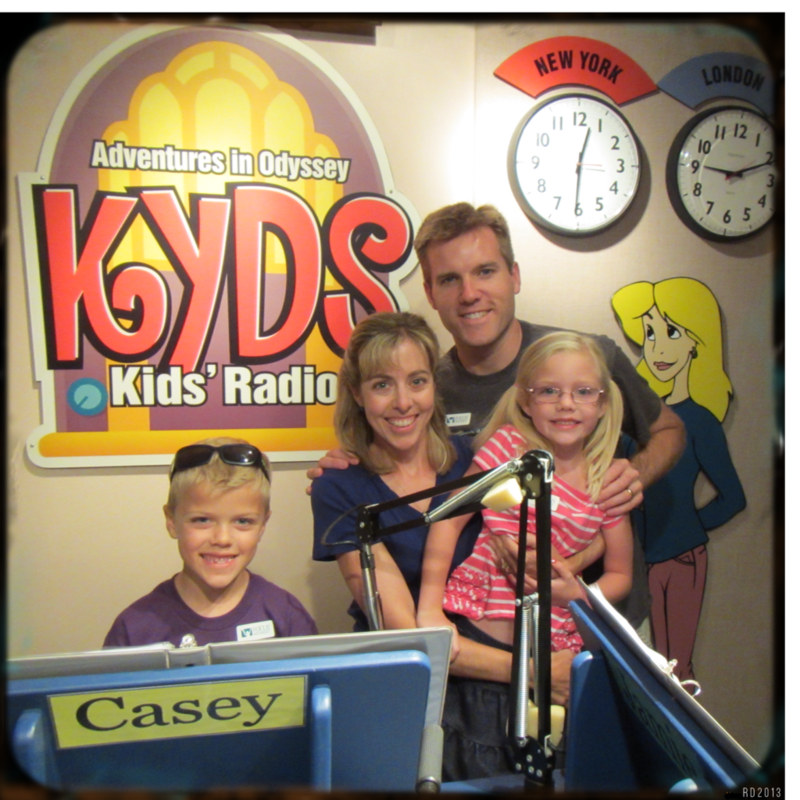 Colin and I had speaking parts, while Kevin and Lucy handled all the sound effects. 5. Build a sandcastle. 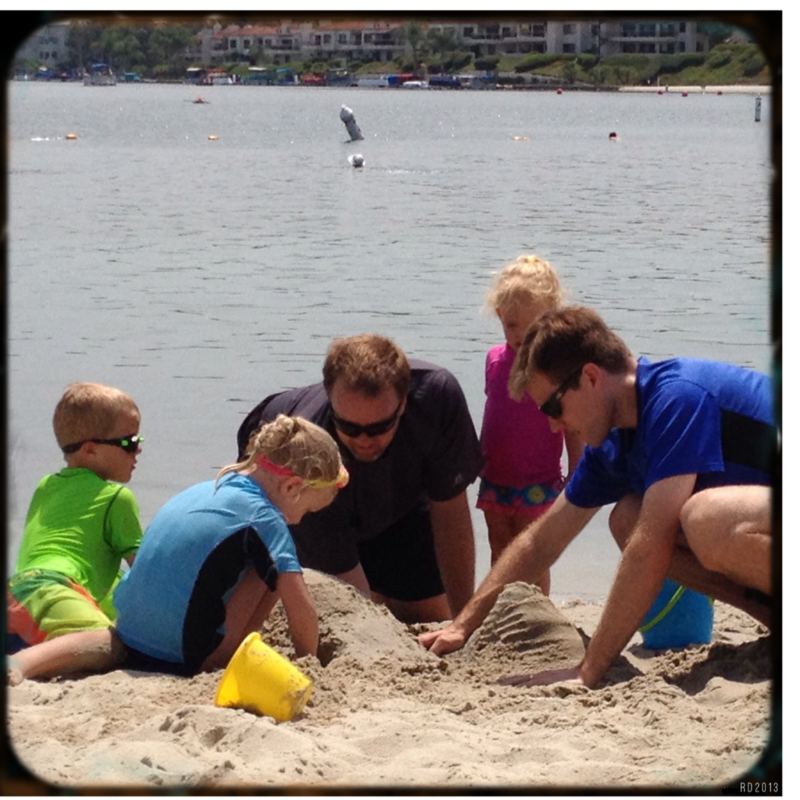 We actually built quite a few sandcastles this summer! This one was a cooperative effort with some special friends, the Dorn family, visiting from our college town on the Central Coast of California. 6. Have 3 sleepovers. 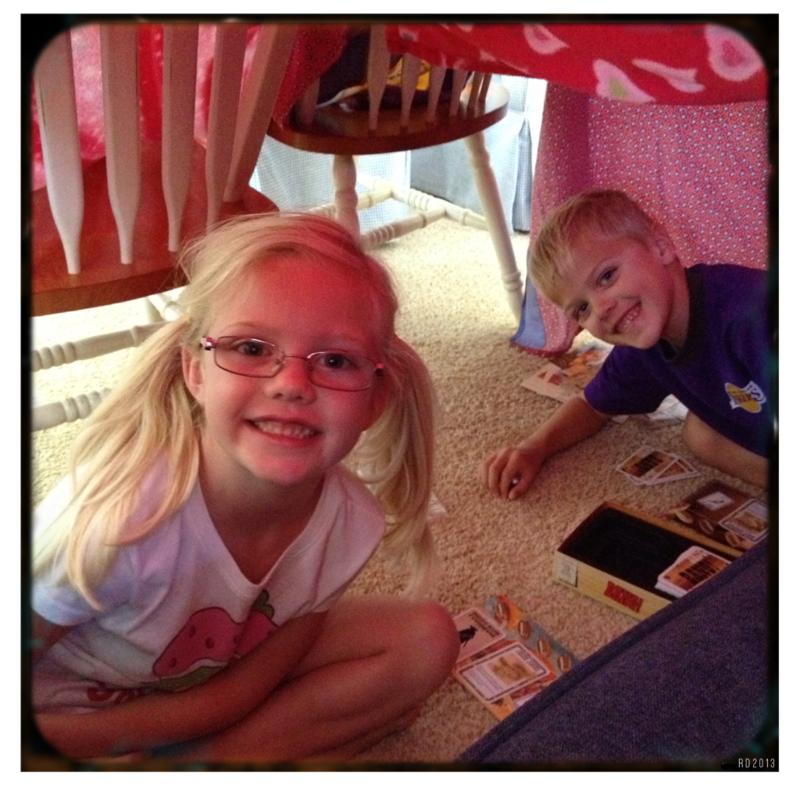 This one was with two of our best, best buddies – Andrew and Anna-Kate. Notice the matching jammies? A must for any good sleepover! 7. 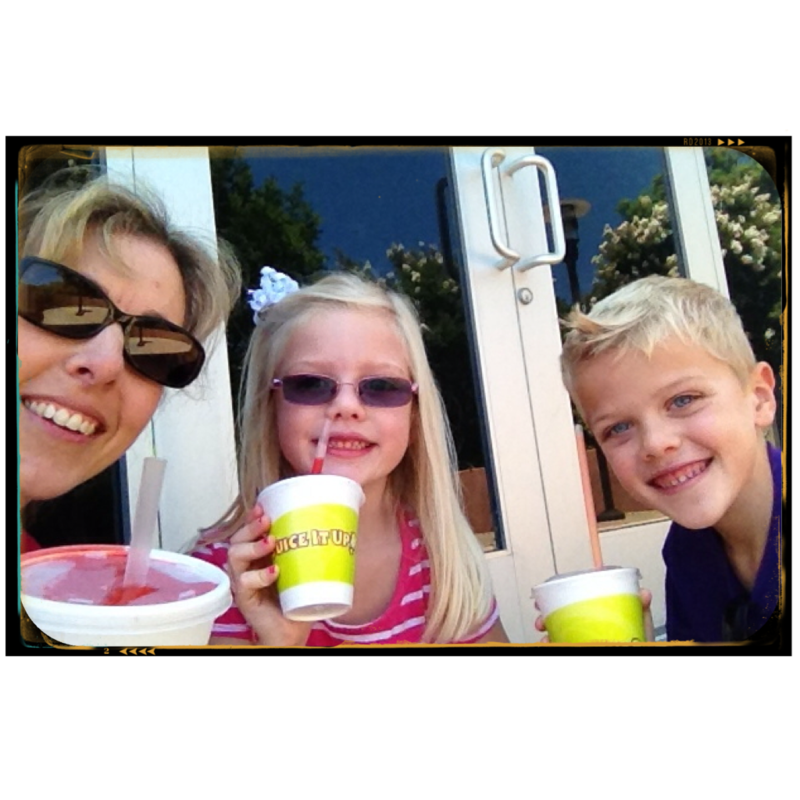 Walk to Juice It Up for smoothies and walk to the other side of town and across the Ladera bridge. This ended up being about a 4-mile walk, so it was a big accomplishment for little feet! The smoothie stop is at the top of a large hill so we stopped to enjoy the refreshing smoothies and play our new favorite card game, Bang. 9. Eat at Denny’s. This is kind of a random one, but ever since my son was little, he has been asking to eat at Denny’s! We don’t eat out a ton and when we do, Denny’s isn’t the first place we think to go, so it hasn’t happened. Until now! 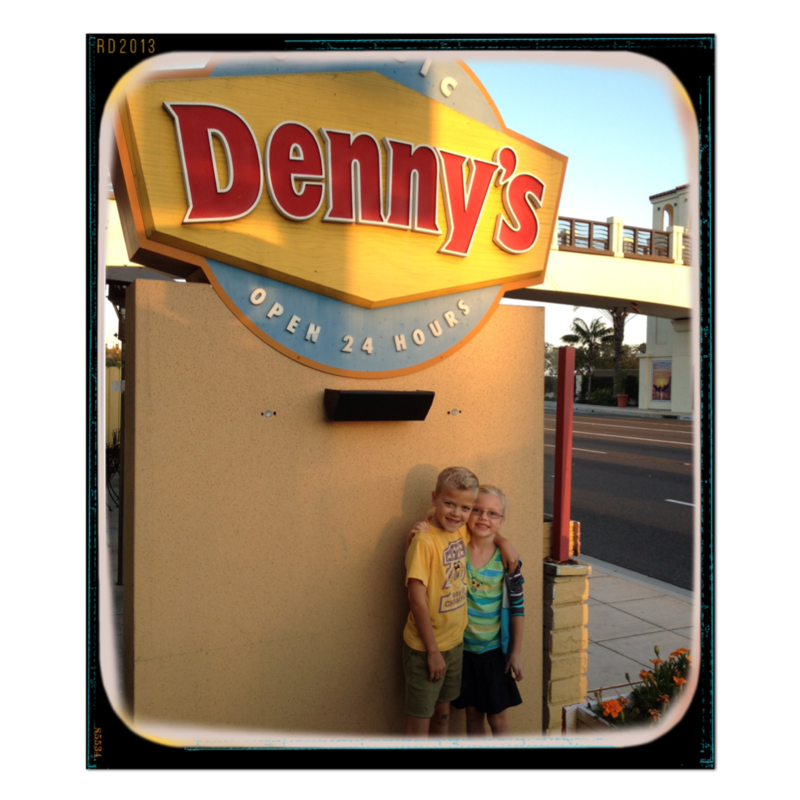 When we asked Colin what he wanted for his birthday dinner, he wanted to go to Denny’s! So we did! Happy Eighth Birthday, Colin! 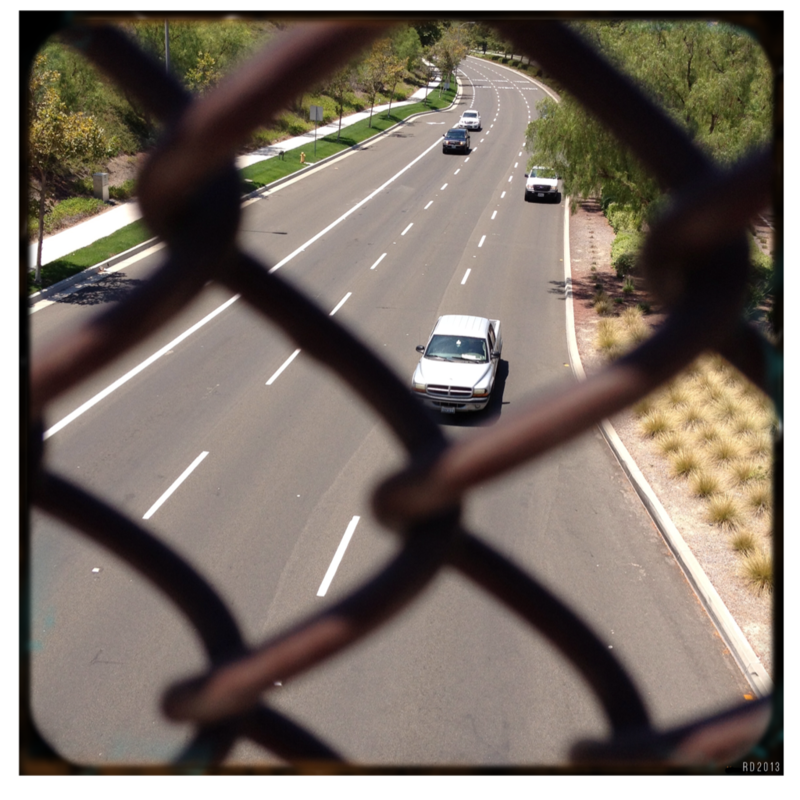 With a little bit of creativity, it doesn’t take much to turn an ordinary summer day into an adventure. And it really doesn’t have to cost much – if anything – either! What were some of your favorite adventures this summer? I’d definitely love some new ideas to store away for next year. Anybody else try a bucket list? Tell me about it! 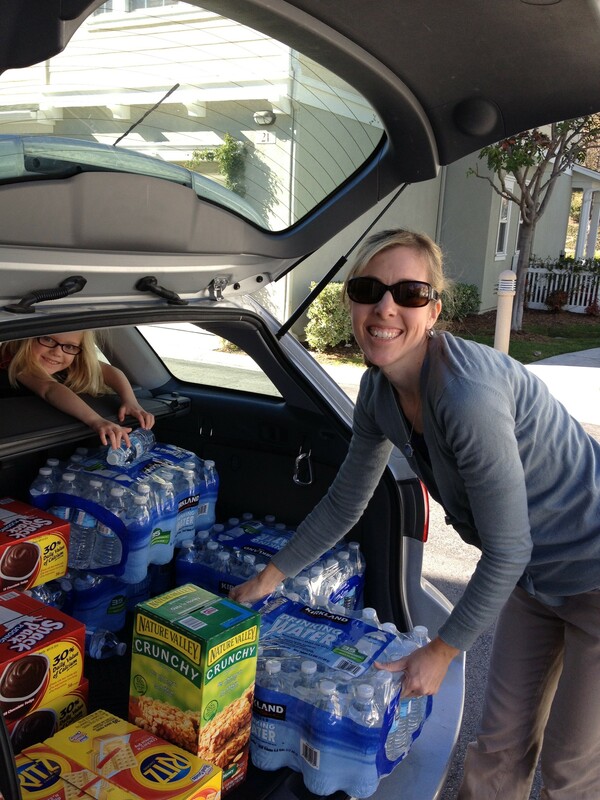 School starts tomorrow at the Garibaldi house! Sad to be saying goodbye to summer (I’ll have more on that later this week! )…but also excited for the promise of a new school year. 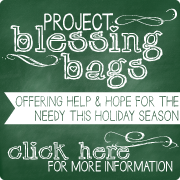 For us, the start of school means a new opportunity to be a blessing to a special teacher. 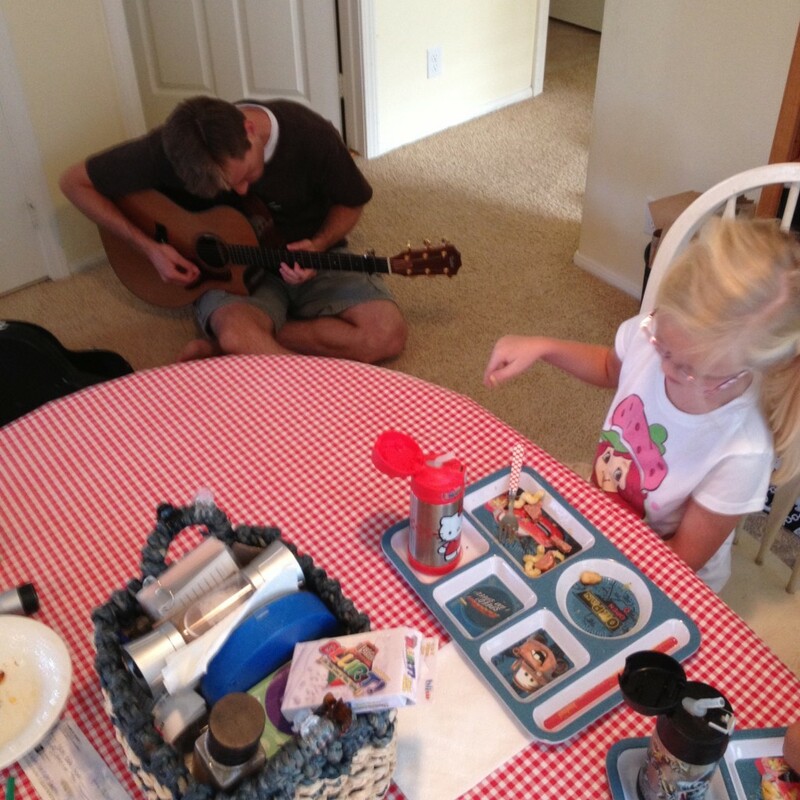 Having been a teacher myself, I know how much it means to get the school year off on the right foot with each family. 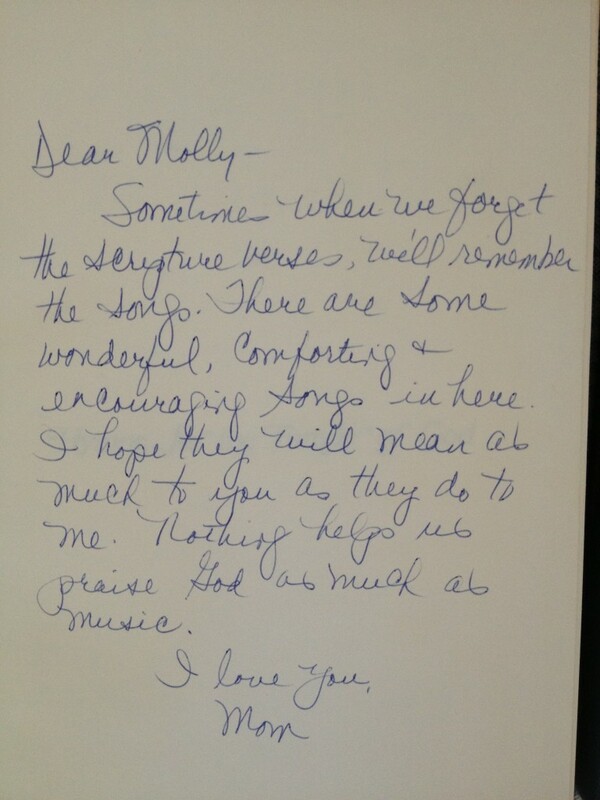 I know how the smallest gesture of appreciation can bring the greatest encouragement! So, as I mentioned last week in my “Sneak Peek” HERE, we’ve begun a tradition of ending the summer with some fun days of crafting. Making small, inexpensive gifts for the teachers is FUN, helps us all transition into the mode of school, and models for the kids an important level of respect and service to their new teachers. This year, we made PRAYER BOXES! 1. First, the materials: small brown craft boxes (got mine for $2.99 at Michael’s minus 40% off with a coupon! 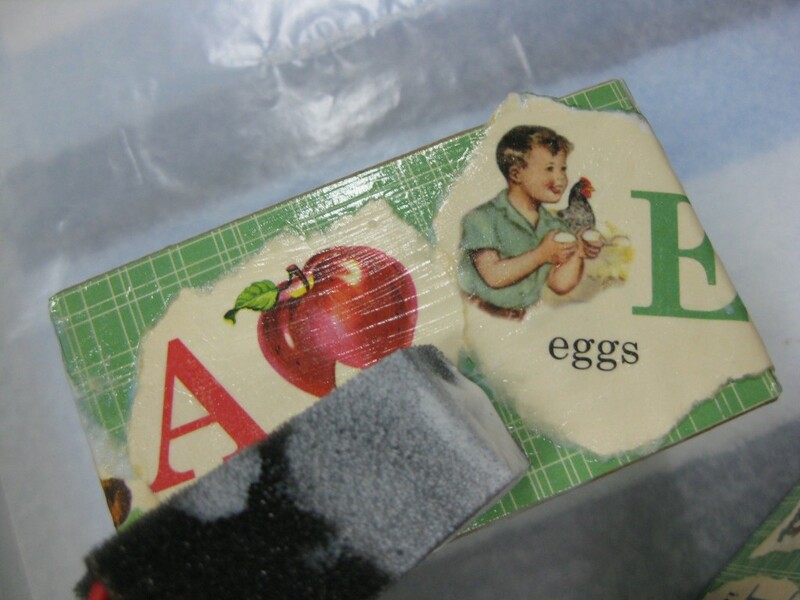 ), Mod Podge glue, foam brush, cute scrapbooking paper, and some coordinating washi tape. I would also recommend you use wax paper on your work surface (the glue won’t stick to it and makes for easy clean-up) and have some wet wipes nearby to catch drips or wipe excess glue. 2. Prepare your paper. 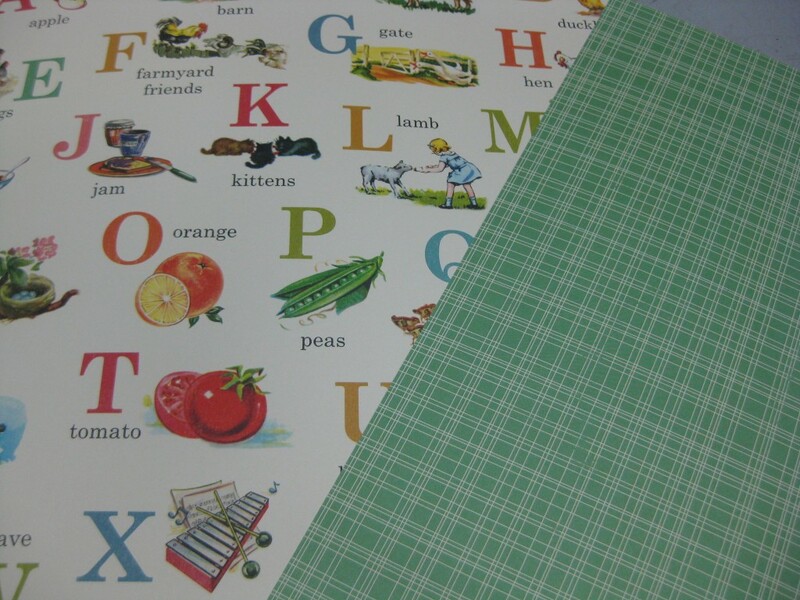 Since we were making these for teachers, the kids and I found some adorable, vintage school paper with alphabets and primer reader illustrations. We chose to do a little tear-art (one of my favorite techniques – especially with young kids who have a hard time cutting smooth lines around objects). 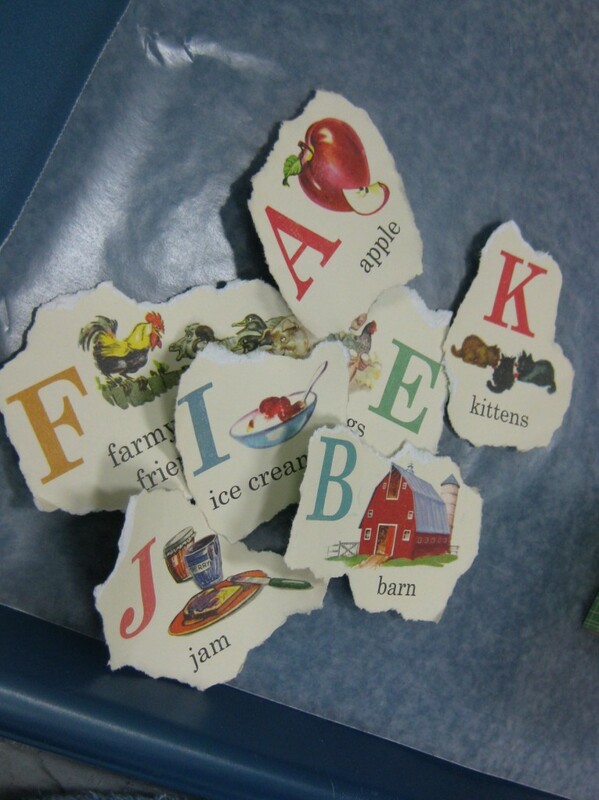 We carefully tore around each of the letters and made a pile of those so we could pick and choose as we layered. 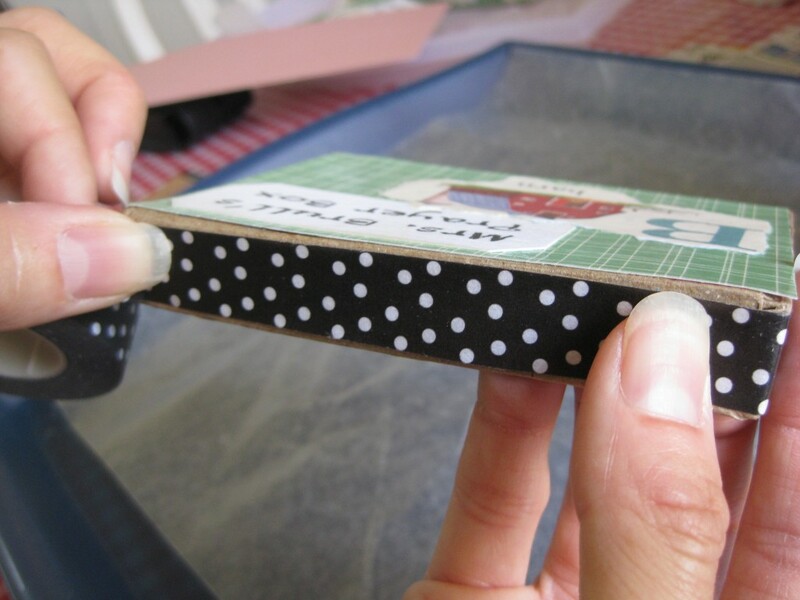 Measure each side of your craft box and cut scrapbooking paper to fit all 4 sides and the top of the lid. We chose to leave the bottom of the box plain – which made a nice place for the kids to sign and date the box. 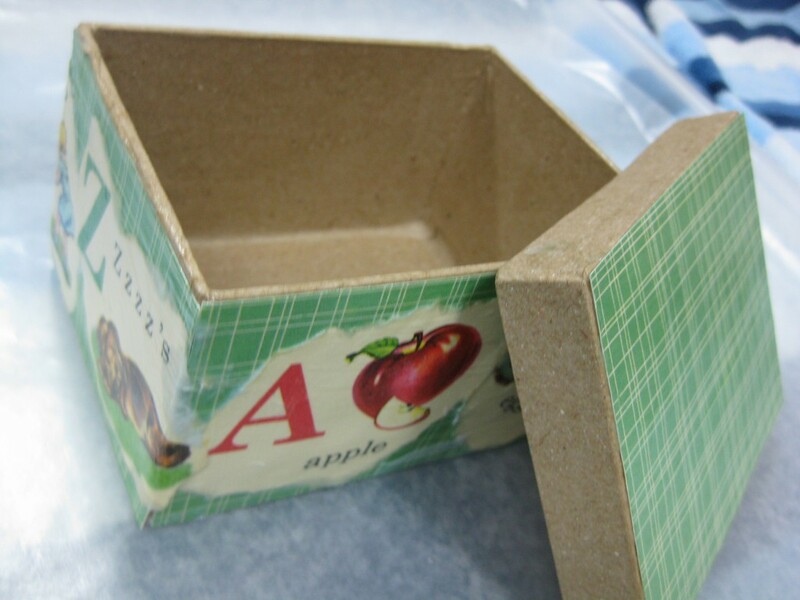 It also made it easier to hold and allow the box to dry without having used glue on every side. 4. Get painting! 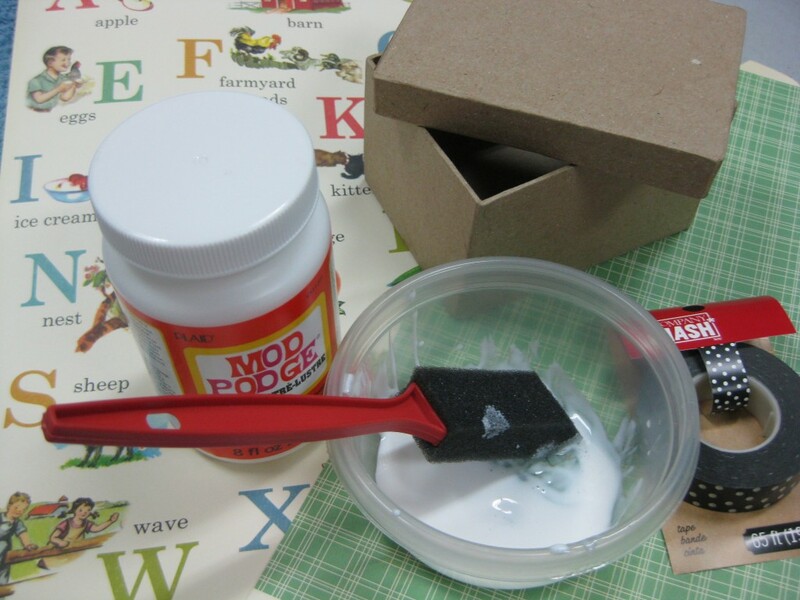 Using the foam brush, soak both the back side of the paper and one side of the box with mod podge. I love using mod podge! If you haven’t used it before, BEWARE! It is a little addictive! 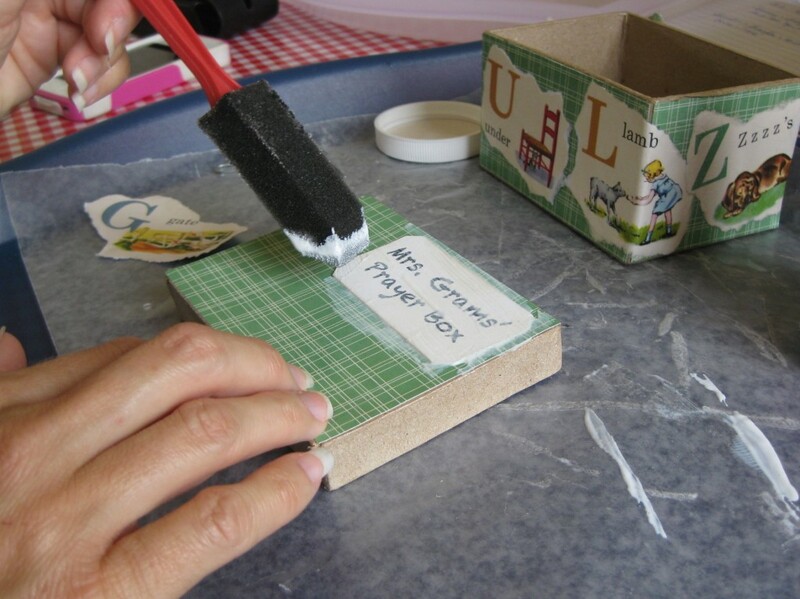 Mod Podge is very forgiving, which is one of the reasons I love to work with it. 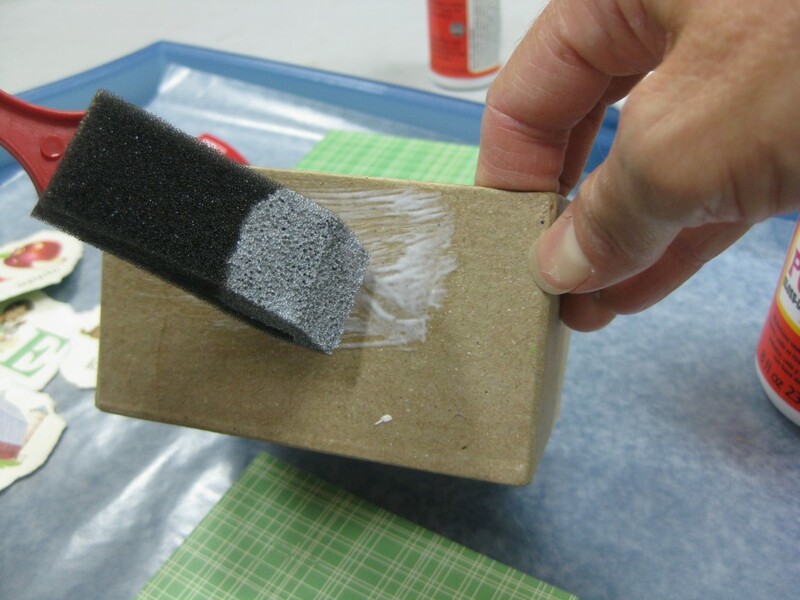 You can slather it on, your project looks like a mess, but in a matter of minutes, the glue dries clear and your project is sealed and looks so professional! Place your paper where you want it. 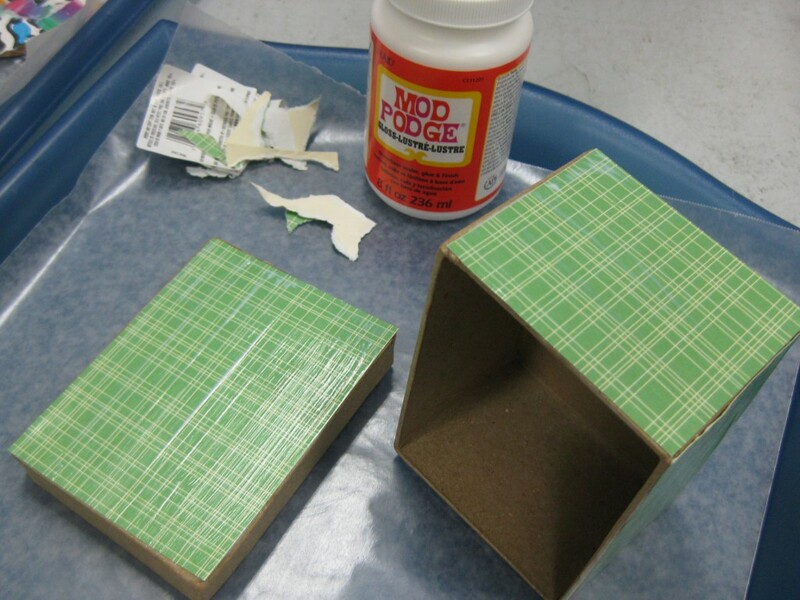 The mod podge will be slippery which allows you to reposition it until you get it right into place. Once the paper is in place, generously paint more mod podge on top of the paper. Use your finger and the brush to smooth and press as you go. You want to make sure you don’t leave any air pockets under the paper and that every edge is well-sealed with the glue. We went ahead and did all 4 sides of the boxes and the lids at once and then let them dry a little before doing the second layer with the ABC paper. 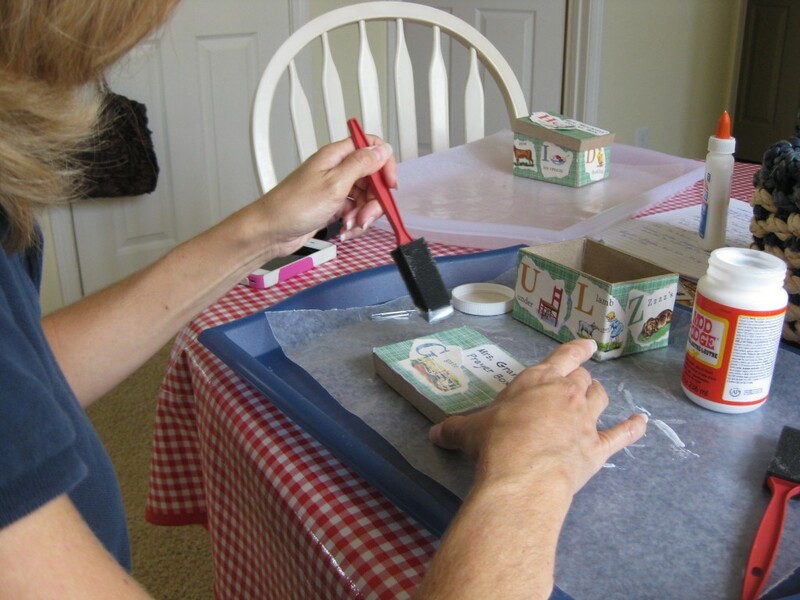 However, one of the nice things about mod podge is that you can easily do several layers at once, as long as you soak each layer with glue, top and bottom. What gives the glue such a nice seal is that it soaks into the paper. This also makes the paper very flexible and able to wrap around curves. We hadn’t quite decided how we wanted to so the second layer, so we figured it out while they dried. We glued the second layer just like we had done the first, with the added touch of folding the torn pieces of paper around the corners. Isn’t cool how that works! I tell, you, MAGIC! My 8-year-old pretty much did this layer all by himself. I just went over it when he was done to check that all the edges were sealed, and he had done a great job! To help my 5-year-old be successful, I let her glue the backside of the piece and lay it in place where she wanted it. I could adjust it a bit, if necessary, and then brushed the glue over the top to seal it. 5. Personalize it! The majority of the project is now complete, with just a few final details. We added one more letter on the lid to match the teacher’s last name. To finish the edges of the lid, we used a sweet black and white polka dot washi tape (you know I’m partial to polka dots…gotta have at least a touch of dots! 🙂 ) The 15 mm. washi tape fit perfectly! The final touch to personalize the boxes is to type up and print a list of student names. 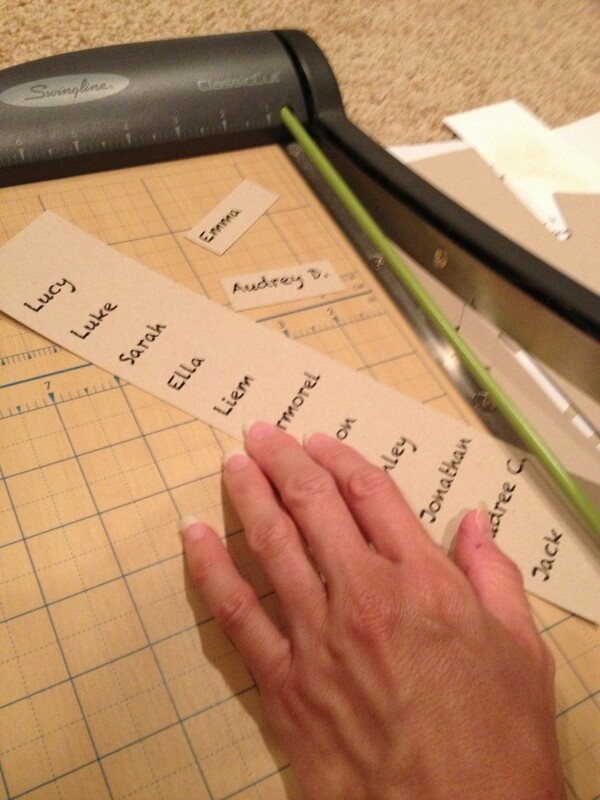 I chopped them up super quickly on my paper cutter and put one set of student names in each box. 6. Almost there! One last, important step: Package! The kids and I kept it simple – just a piece of black and white baker’s twine. How sweet is that?? Seriously! So fun and so simple. It didn’t take much to make it look professional, but yet it still has that very sweet, handmade look that the teachers will love! By the way, I wasn’t kidding when I said inexpensive. I spent about $20 in supplies, some of which I can reuse like the foam brushes, the mod podge (only used about 1/3 the jar), and washi tape (barely made a dent in the roll!). We made 3 boxes, so considering the re-usable stuff, in my estimation, that puts the cost at right around $5/box! The best part? 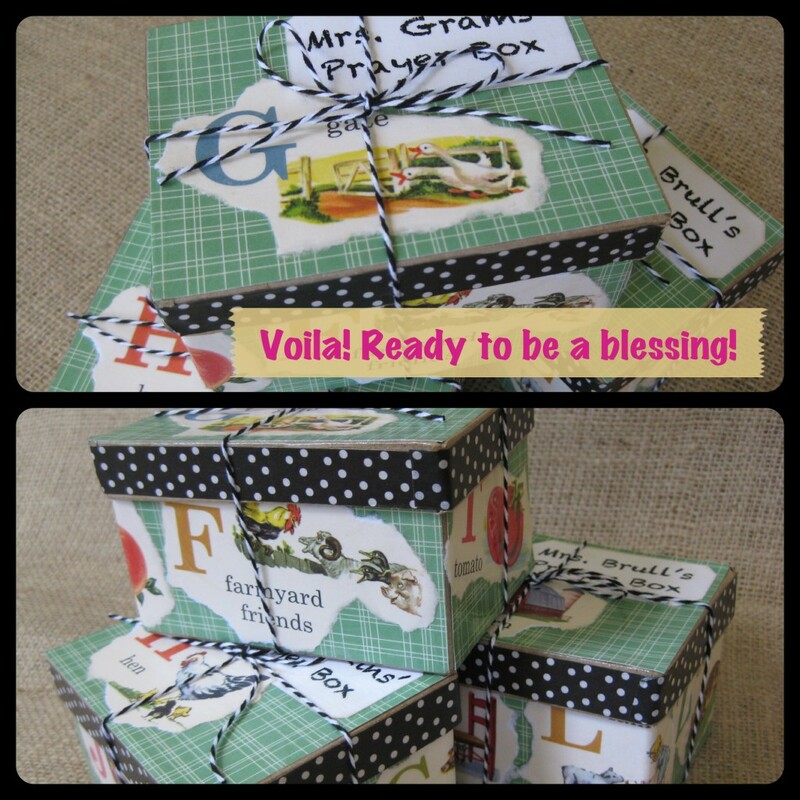 Hopefully the prayer box is a good guarantee that my kids’ will be the recipients of some faithful prayers! 🙂 Even better – pair it with a personalized set of Throne of Grace’s “How to Pray for Your Students”! 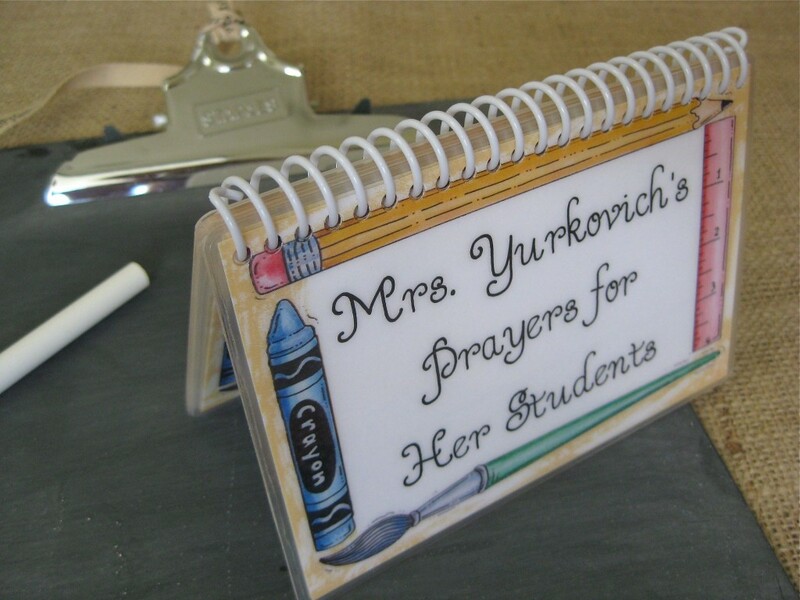 Even if your children don’t attend school outside the home, or if they are in a public school setting with non-Christian teachers, there are certainly many others in your life who would love a handmade prayer box. 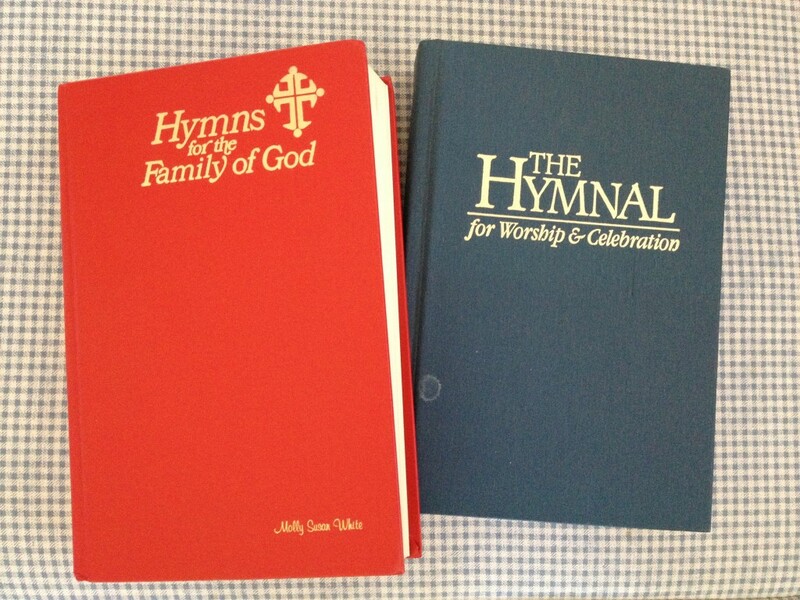 Want a special way to bless a new Sunday School teacher or coach? 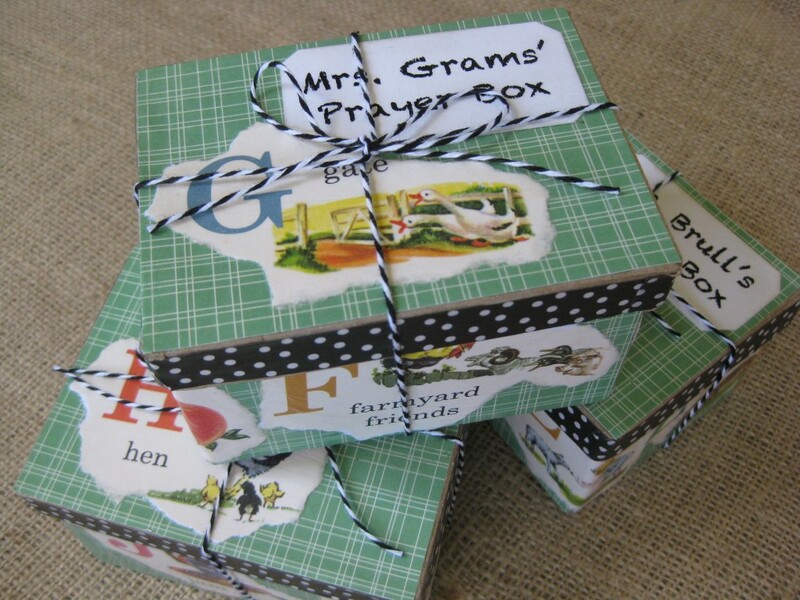 Grandparents Day is coming up…Perhaps you know a grandparent who would love a prayer box filled with the names of his or her kids and grandkids! 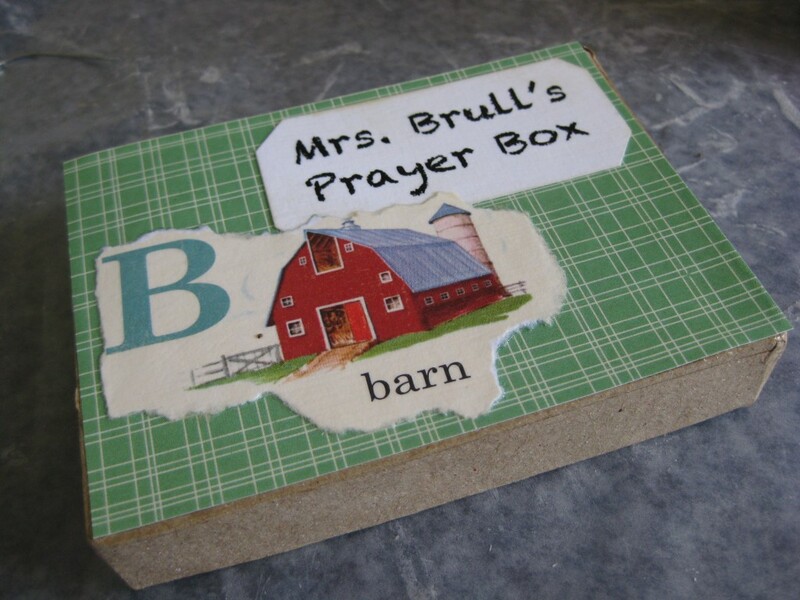 Who would you like to bless with a DIY Prayer Box? Any experienced mod podgers out there? 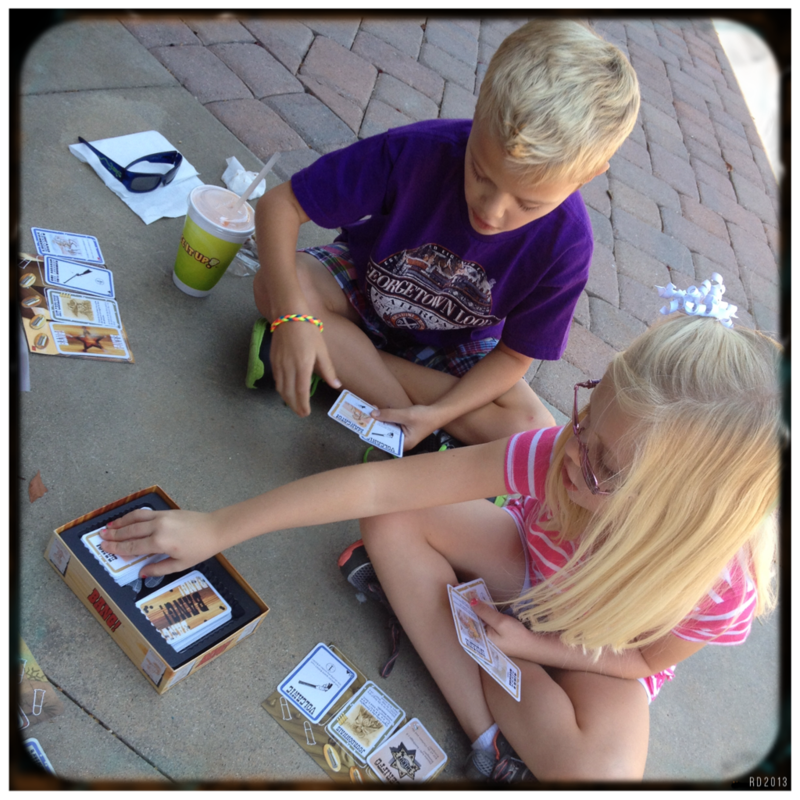 I’m always looking for fresh and fun ways to use my mod podge magic! I’d love to hear YOUR ideas!